Convert bitmap graphic files to ZZT boards! ZIG is a ZZT clone with a decent fanbase and quite a few games to its name! Check out its own sub-archive on z2! This is a nifty program that will compress your .ZZT files and save games. It gives you an easy-to-use environment to pick a game to play, then it decompresses the game and all the save games needed for it so you can play. It then automatically starts the game. 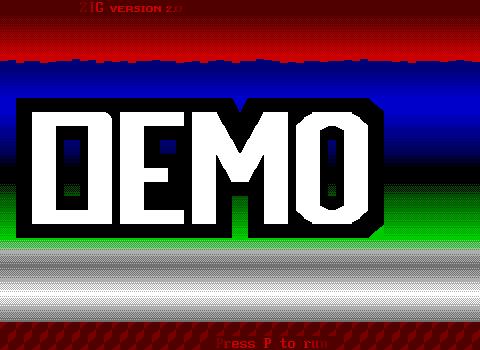 When you quit ZZT, the game is decompressed and you are returned to the menu. This isn't very useful for people who create a lot of ZZT games and there is a possibility of getting all your games wiped out. Be careful with it. However, it saves a lot of space and keeps your ZZT folder nice and tidy. You'll need PKZip on your system to use this. Lock and unlock ZZT worlds with this program. 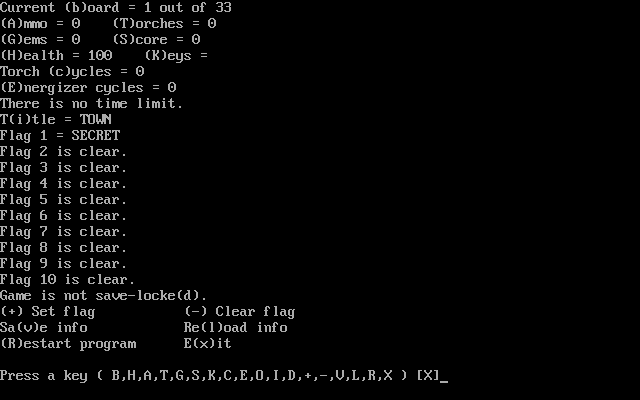 This utility will enable those whose computers have an atypical ASCII character set; it simply allows you to run ZZT with the normal 256 characters. There has been some controversy on whether or not this utility is the same as the ZZM Studio. It looks the exact same except for the VMUs, but it also has support for 64th notes and all 9 drums! At its current state, it can't do much. However, it sounds to be quite a promising utility. Right now, you can type in music, test it, and save it to a ZZM file. Allows you to completely manipulate the amount of health, ammo, torches, etc. you will start with in a ZZT game. ZZT Faces allows you to change the default "HAPPY" ZZT player icon into one that conveys another expression, or none at all, if that's what you'd like! A promising front end that was just discontinued. A pity, as with a little work it could have been really good. A program for listing .COM fonts, previewing them, and launching ZZT with them activated. This neat package will update all of ZZT's default help files with a lot of new information about the program and its elements. Some alternative icons to use for ZZT's executable and worlds. This program allows you to edit and view everything you want to start with before you play a game. This includes ammo, torches, gems, health, score, energizer time left, torch time left, time that has ticked away (in a time limit board), keys, the name of the game, all 10 flags, whether it's save-locked or not, which board you're on, and a whole lot more! Most useful when editing save games. 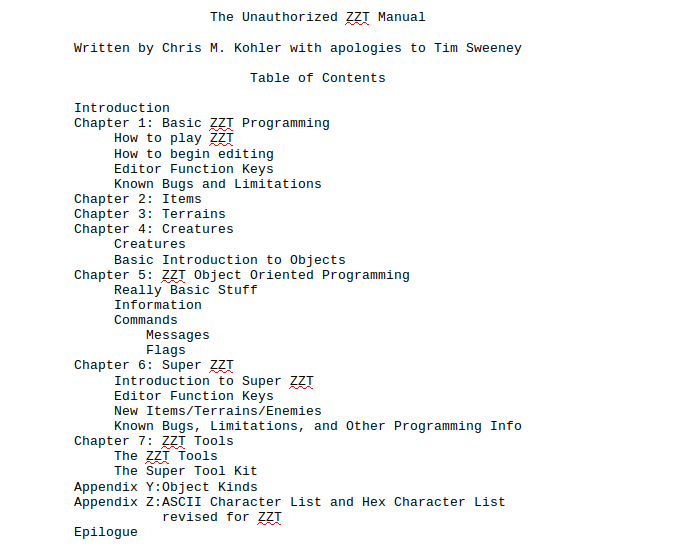 An early help document covering how to use ZZT and its editor. Includes reference to valid command, elements, and ASCII characters. 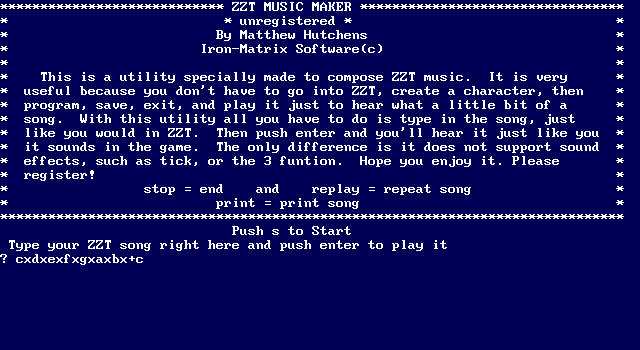 ZZTMuzMak is a program that allows your to create ZZT music in a .MOD-like setting. It will export to #play code, which you can then import into your games. 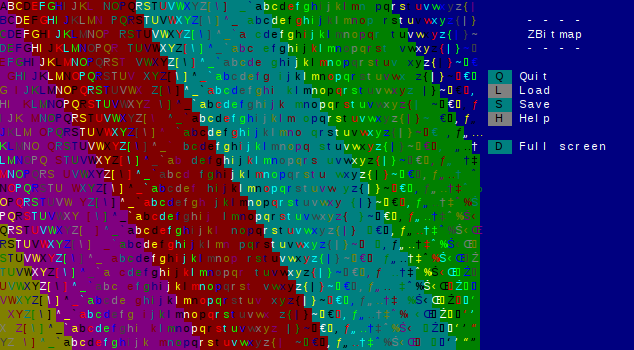 It does not many features, but if manipulated correctly, it can be used to export other kinds of ZZT code as well. A simple program which allows you to type in valid #play commands and hear them played back. 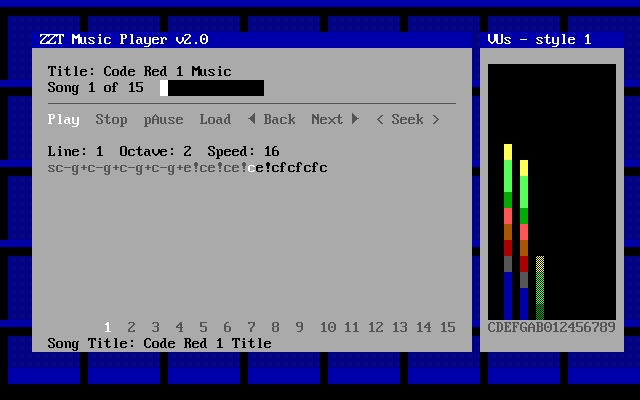 A player program for ZZM audio files. Also includes a program to rip songs from ZZT worlds into ZZM format.